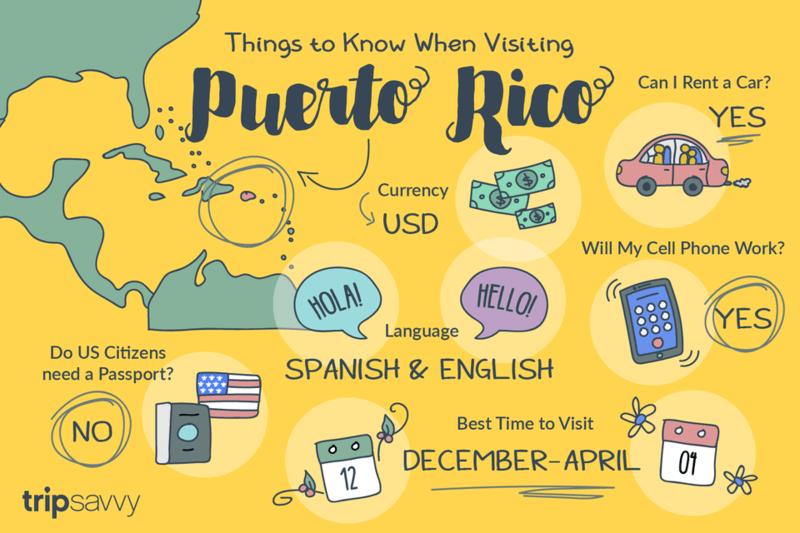 First things first, you don't need a passport when you travel to Puerto Rico, it's like going anywhere within the U.S. All you need is a driver’s license or another valid form of photo ID. In fact, Puerto Rico is one of only two destinations in the Caribbean (the other is the U.S. Virgin Islands) that do not require U.S. citizens to carry a passport. Yes, your cell phone should work in San Juan and most of the cities. Will I Need to Convert Money? No. The dollar is the only currency you’ll need. Both Spanish and English are the official languages of Puerto Rico. In the big cities and in the islands of Vieques and Culebra, you can get by without a word of Spanish. The people who work in the tourist trade—waiters, shopkeepers, guides, etc.—usually speak fluent English. The police are another issue: It’s not easy to find an English-speaking cop. The farther away you move into the less urban interior of the island, the more you’ll need to have some command of the language. This is a matter of some debate. Puerto Rico has two seasons, and these follow the weather. The peak travel period is December to April when Americans escaping the winter invade the island by boat- and planeloads. In this season, you’ll pay the highest prices for hotels, and you’d be wise to reserve restaurants and activities in advance. The low season falls between May and November, and this is when travelers can find terrific deals on hotels, airfare, and vacation packages. Of course, June 1 to November 30 is also hurricane season. Do I Need to Avoid Hurricane Season? The National Weather Service’s Climate Prediction Center provides online statistics and predictions. The Weather Channel offers daily, weekly, and monthly data on every city it covers. Cost – In general, you’ll pay a bit more than the average price of a rental in the U.S. (try the local competition for better rates). You may also be required to pay liability insurance: credit cards that offer auto coverage in the continental U.S. don’t always extend that coverage to Puerto Rico, and your insurance company may not cover the island. What do you want to do? – If you plan to explore the island in depth, you’ll definitely need a car. Also, people traveling to Vieques and Culebra should consider renting a jeep or car once they get there. But, if you are sticking around San Juan, forget the rental. Old San Juan is a walking city, and you can easily get around the city in a taxi or a bus. Parking and traffic can be a nightmare in the city, and a rental might be more trouble than it's worth. Numeric confusion – For reasons best known to themselves, Puerto Ricans use both miles and kilometers: distances are posted in kilometers, while speed limits are shown in miles. Also, gas is sold in liters, not gallons. Traffic – Puerto Rican motorists are in a great, careening hurry to get places, and the orderly laws of road conduct are more loose guidelines than strict rules here. This makes for a sometimes harrowing experience for timid drivers. If aggressive drivers scare you, a rental might not be your thing.